NEUSPEED Springs - SofSport - Dezod Motorsports Inc - Home of the automotive performance enthusiast since 2002. High performance while retaining ground clearance. NEUSPEED SofSport springs are developed exclusively by NEUSPEED and designed specifically for performance driving in areas with snow and rough road conditions. 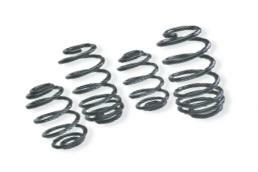 While providing the same handling characteristics as our Sport kits, the NEUSPEED SofSport springs do not lower the vehicle as much as the sport springs, allowing it to retain necessary ground clearance. This is perfect for the enthusiast who deals with rough roads or snow conditions.